Last year, Western governments carried out intensive and ultimately successful campaigns to prevent Iran’s election to the Human Rights Council and the UN Women’s executive board. This year, a similar campaign opposing Syria’s election to the HRC gained Asian and Arab support despite the regional group unity that usually dictates such candidacies. Yesterday, Syria surrendered to pressure from its Arab neighbors and the wider international community and withdrew its candidacy for the Council. Kuwait was waiting in the wings and its decision to enter the race sealed Syria fate — at best, it would have lost very badly — and likely forced its decision to withdraw. The Kuwaiti government has informed Western officials that it will mount a bid for the Arab seat on the U.N. Human Rights Council, setting the stage for a likely end to Syria’s controversial campaign to join the 47-member rights body, U.N. based diplomats told Turtle Bay. 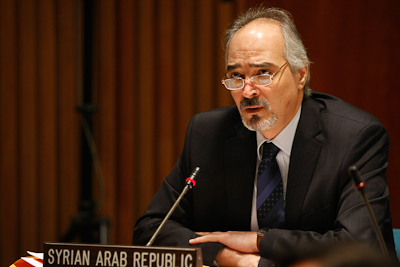 Syria has not yet announced a decision to withdraw from the race, and its U.N. ambassador,Bashar Jaafari, told Turtle Bay Monday afternoon that his government planned to continue its pursuit of the seat. But the U.N.-based diplomat said that Syria has been engaged this week in talks with Kuwait and other Arab countries about the prospect of swapping Syria’s rights seat for another U.N.-based post in the future. The public announcement was made late Tuesday evening. Egypt was among the Arab governments pushing Syria to withdraw, and the negotiations apparently resulted from an agreement that Syria and Kuwait will simply swap when they intended to stand for elections to the HRC. “Kuwait will run now and Syria will run in 2013,” Ambassador Maged Abdelaziz said in an interview. He said Kuwait has agreed to become a candidate for one of four seats on the Geneva-based panel that will go to Asian nations when the UN General Assembly elects 15 new members on May 20. While Kuwait is a much more respectable candidate for the Council, Syria’s withdrawal is not the victory for human rights as many are proclaiming. The Asian group is still offering a closed slate — 4 candidates for 4 seats — that offer no real choice among competing candidates. The defeat of Syria on a competitive slate would have made a much stronger statement in favor of governments that adhere to international human rights norms than Kuwait, with its own human rights challenges, being seated on the Council without question. Remaining of course will be the concern among human rights groups and UN reformers is whether Syria will be given a “consolation prize” or goes unchallenged in 2013. UN Watch hailed the breaking news that Syria is expected to drop its bid, but expressed concern that it might be replaced by Kuwait — “far better than Syria, but another non-democracy nevertheless” — and urged against giving the Assad regime a consolation prize akin to Iran’s receipt of a seat on the UN Commission on the Status of Women, in exchange for dropping its 2010 bid for a council seat. We’re far better off with the Kuwait as the shoe-in for the fourth Asian seat, but serious observers should acknowledge the hollowness of the victory and the efforts that must continue for human rights accountability and global elections reform.